Mrs. Miner's Kindergarten Monkey Business: A Customized Vinyl Banner for only $7.95 including shipping! A Customized Vinyl Banner for only $7.95 including shipping! So, teaching kindergarten is a huge passion of mine, but I will let you in on my other passion: bargain and/or FREE shopping. Because of this, I go to http://Hip2save.com EVERY SINGLE DAY and check out all of the cool things that she has found acrossed the internet for cheap or even free! A lot of times, I take the ideas and make them work for my classroom because I LOVE to have new things for my classroom, but DO NOT LOVE spending my family's money on it. I also LOVE to be creative. So, I will take all of those loves and share an idea for you. If you’re planning an upcoming birthday party, baby shower, anniversary, summer Luau, or other special event, have I got a great deal for you! Now through 6/30, SHinDigZ.com is offering up customized 18″x54″ Horizontal Vinyl banners for ONLY $1 (reg. $14.99) plus $6.95 shipping/handling whenever you enter the promo code SZX6NE at checkout! Keep in mind that these banners are vinyl, so you may want to consider creating them in a way where you can reuse them for multiple occasions! This seems like a great deal, and would be a fun way spruce up the decorations for any special event or festivity! * Be sure to go through ShopatHome to get a whopping 15% cash back on all SHinDigZ.com orders! I went to SHinDigZ.com and what I found was fantastic. I have found with personalized bargains like this, you are locked into choosing a few designs and it makes the offer much less appealing to me. Here, your creativity is your limit. They have many "starters" for you and you can customize using pictures or images you have on your computer! This is a vinyl banner for you to use in your classroom year after year! Make sure to put in the code in Collin's promo code listed above before you check out. It will take 13.99 off a 14.99 banner. 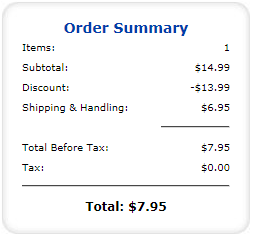 So, basically, you will be paying for the 6.95 shipping. Let me know if you order something or have great ideas to put this to use. Great one, And its very true, Using pvc banners, you can promote any event or brand effectively.